I absolutely love the Switchfoot song This Is Home and could listen to it over and over. (Sometimes I do!) It touches something deep inside my heart. I mean, just the word ‘home’ unearths memories and feelings. It’s fraught with an immense gamut of emotions. It’s my guess that we all long to experience ‘home’ in the best sense of the word. I think that’s why, especially over the holidays, we can get so emotionally conflicted. We find ourselves grieving at a time when everyone (it seems) is celebrating. We long for home while at the same time knowing ours wasn’t really a place of love or safety, or perhaps it was but we’ve moved across country or our parents are divorced or no longer living. We long for home to be static, to be permanent, yet it is neither of those. Our hearts long for home regardless of our age or gender. Not necessarily our home, but a home to go home to, to be welcomed in with open arms and hugs and aromas of favorite foods made especially for us. We ache for a home that isn’t filled with anger and resentment, that isn’t pocked by emotional scars left by prior fights and arguments. If we do manage to go home, we tiptoe around to avoid setting off any land mines that might ruin another visit. If that isn’t our experience, perhaps we wish our family was home long enough all at the same time to actually be together. We long for parents who aren’t so busy in their own worlds that they notice us, make time for us and value us. Maybe we yearn for what used to be but is no longer. Inevitably, eventually our earthly home will be invaded by loss of some kind. Whether by growing up and moving out, job changes, aging parents, health issues, death or divorce, families change. Home changes. Nothing stays the same. If we could freeze a frame from our life to go home to it’d probably be a favorite Christmas or birthday or family meal of some kind that made us feel special. Home is supposed to be a place where we are safe, accepted as we are, loved, cherished, nurtured, enveloped and valued. It’s supposed to be a place where our needs are met, our presence is enjoyed and our dreams are fueled and fulfilled. It’s supposed to be a haven, a refuge, a place of rest and refreshment and recuperation. In Isaiah 32:18 God says, “My people will live in peaceful dwelling places, in secure homes, in undisturbed places of rest.” Doesn’t that sound incredible?! I think this is God’s ideal for our homes: to be places that are safe, secure, peaceful and restful. Ahhhhhhh. Home. I don’t need to point out the discrepancies between the ideal and reality. And, despite all our best efforts to hold those longings at bay, to tell ourselves to be logical and analytical, we still find our hearts wistful. We’re on the brink of Thanksgiving, Hanukkah, Christmas and New Years. We’ll be making or feeling the pressure to make trips back to the homes in which we were raised or to attend meals with family. These activities have the potential to be catalysts for reopening old wounds or creating new ones. This time of year inevitably focuses our attention on what we feel should have been yet isn’t and perhaps will never be. It yanks our hearts back to aching for Real Home. I have said before that the only thing in my life that never changes is the fact that nothing ever stays the same! But there is one other reality. God never changes. He is the same yesterday as He is today and as He will be tomorrow and forever. There is a home that is perfect and will never change! That encourages me! God is my safe place. As I put my trust in Him, as I believe that He is my Ultimate Home, I will experience home even though my home of origin is no longer in existence. My parents and oldest brother have died. 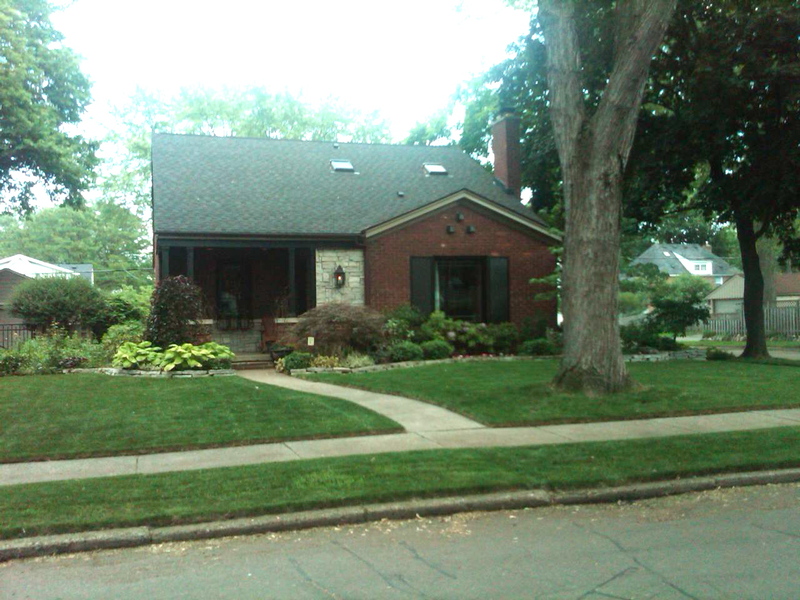 The home pictured above is inhabited by another family. I have memories but that’s all that remains of my childhood home. I know you can relate in some way yourself. 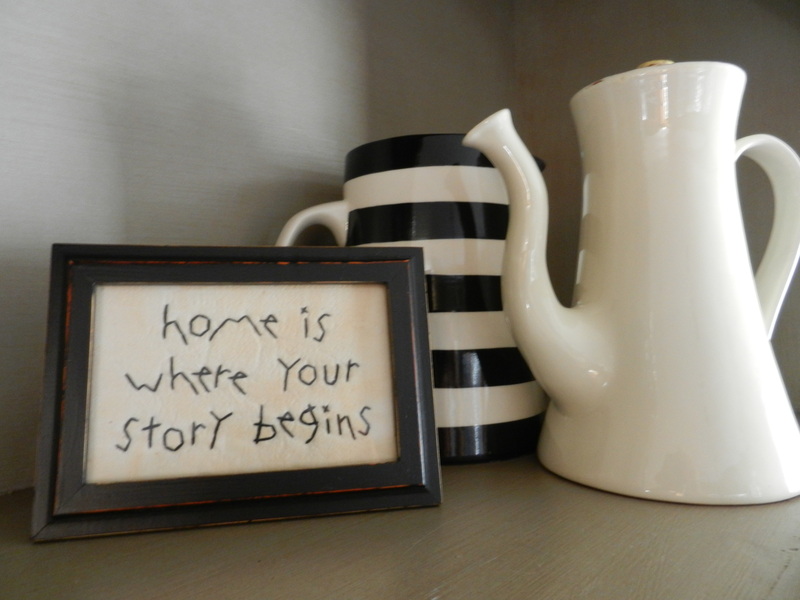 I have a little framed print that says, “Home is where your story begins.” I love that saying and I look at it pretty much every day. I love it because I think of my precious children, now adults. Our home is where they found their beginning. It wasn’t a perfect one, although we tried and gave it our absolute best. But the beautiful reality is that word ‘begins’. Their stories began in our home, but they aren’t set in stone. The same is true for me. I had a good home, yet I suffer the effects of life begun in an imperfect one. But my story isn’t over either! It is still being written! And the best part of the story is that my home of origin is not my final home. God is my safe place, my Home. I am safe in Him. In Him I am secure, loved, cherished and nurtured. Ultimately, heaven will be my final destination and it will be Home like God intended from the very beginning. Jesus’s words are powerful. I have known since I was a small child that we are supposed to love our enemies, yet I never really saw that modeled very well in Christendom. I saw plenty of judgment. I saw Christians huddle together as if protecting themselves from sin getting on them by proximity. Sadly, I was often in that huddle in high school through my early adulthood, until I spent time around ‘radical’ Christians. Over the years, I have seen the smugness and religious superiority of many who say they are Christians, and it’s these self-righteous people who haven’t learned compassion, who are skilled judge-ers. If I had an understanding, it would lead me to compassion. Since I don’t understand, I must choose compassion. Once I make the choice, the feelings always follow. I’m learning it really isn’t about the drugs, the food or the stuff. It’s about heart issues. It’s about longing for acceptance and love. It’s about wounds from the past clinging to a tender, confused or angry broken heart with talons that fiercely refuse to unclasp their grip without a terrible battle. Compassion says, whether I understand or not, I’m so sorry you have to struggle with that. I’m just so sorry. Someone working with the addicted or the hoarder will need to use different methods and consequences, but for those of us not in the process, love is the only response they need from us. Compassion is a balm that promotes healing. Most Christians don’t understand and unfortunately underestimate the powerful draw of addictions, and even homosexuality. In our ignorance we say, that’s wrong. Stop it. (Or worse, “You’re bad; you’re wicked; God hates you . . .” None of those statements are true, by the way. We’re all bad, sinful and wicked before we go to him in repentance and he forgives and cleans us. God doesn’t hate us. He is kind and merciful to us.) The problem can arise between Christians and those who don’t know Christ yet because too often we Christians don’t see the person, we just see a behavior. We judge. We neglect compassion. We don’t behave like children of the Most High. I’ve heard a scripture verse misused far too often. “Judgment begins in the house of God.” People have misquoted and misinterpreted this and used it as permission to be harshly judgmental towards others. If they read in context, they’d see a completely different message. So, taking this to heart, as I look at people around me every day, in cars, in the grocery store, at the gas station, in a book store . . . I have no idea the struggles they face, the sorrows they carry, the anxiety or depression they live with. It seems we all are broken in some way. We all suffer in some way at some time. Rather than making things worse by judgment, I need to see people with eyes of compassion. I need to behave as the child of the Most High that I am. I need to leave the judgment to him and be a healing balm with compassion and kindness. Today as I was reading in Genesis about Jacob and Leah and Rachel, a pattern, or more accurately a quality stood out to me. A pattern that shows a quality? I’m not sure how to explain it, but you know the story. If not, read Genesis 28 – 31. I’ll write the verses that were particularly interesting to me today. What stood out to me was that God sees. He saw that Jacob was furious that Laban tricked him by giving him Leah instead of Rachel as his wife that first night. How that must have hurt Leah to wake up on her first morning as Jacob’s wife and find him furious he was tricked into marrying her! I can’t imagine what it would feel like to be unloved. You may think I’m reading into the story with my interpretation of it, but think about it. Think about human nature. Think about a man marrying your sister when he really wanted you. Think about being the consolation prize. (You wanted Rachel, but I want more work out of you, so you get Leah. Gee, that’s really valuing to poor Leah!) I’m guessing she was already feeling like a loser because she wasn’t married yet after all those years and she was the older daughter. Marriage was everything in that culture, that and having many sons.) Think about living with your sister in that situation for the rest of your life! Sharing the same husband with your sister? Yuck! Much later, God saw the smug attitude of Leah, so proud she was the wife that was producing children and I’m sure making Rachel’s life miserable. He saw Rachel’s agony enduring the looks from Leah and perhaps unkind words. Perhaps whispers of people in town. He knew the shame she felt because of her barrenness and was moved by compassion to help her. God saw that Laban was using Jacob for his own gain, working him hard for 21 years, continually taking advantage of him. God was not unaware of his difficulties; he saw it all. Consequently, no matter what scheme Laban would come up with, he blessed Jacob abundantly anyway. What amazes me more than just knowing God sees is that God is moved to compassion and kindness in spite of our shortcomings, failures, sinfulness and basic rottenness (which he also sees). Jacob was a master deceiver who, according to the law of reaping and sowing, got what was coming to him. He tricked his brother out of his birthright. He got all the goods, and the blessing of his father as well. I’m sure Leah was no delight to be around when the baby score was 4-0, Leah’s favor. And I’m sure Rachel was no princess holding the “favorite wife” title. I can only imagine the undercurrents going on in that household! They were all imperfect people, yet God saw and met them in their sorrow and need and lavished his love on them anyway! What an amazing God he is. So often people have this idea of God as angry and vindictive when that really isn’t the case. He is righteous and just, yes, and angry when the situation warrants it, yet he is gracious and loving and compassionate more often than not. He sees us in our brokenness and sorrow and longs to help us. I love Psalm 18, I just love it. It expresses what I feel about my situation when I was facing cancer. But it can apply to any situation we have. Ps.18:6 says, “In my distress I called to the Lord; I cried to my God for help. From his temple he heard my voice; my cry came before him, into his ears…” I absolutely love what follows. God gets angry that people are messing with his beloved David and verses 7-15 paint a vivid picture of God coming to the rescue! Verses 16-17 say, “He reached down from on high and took hold of me; he drew me out of deep waters. He rescued me from my powerful enemy, from my foes, who were too strong for me.” Can’t you just see it?! God sees, because he is God, and because he’s attentive and watchful. But he does so much more than see. He sees, he hears, and he answers our prayers. He rescues us when we cry out to him. What a magnificent God!